Hello! 4 Week Meditation Foundation begins today — this evening — just one day before the first day of Spring! What better time to begin a new practice and establish healthy habits than with the season of new growth?! All current MGYS Members receive 50% off on their monthly membership after registration. Gentle, Restorative, and Beginner classes are included (and encouraged) in the Meditation Foundation Course. Classes will meet Tuesdays and Thursdays, 03.19 – 04.11.2019, 7:00-8:15 pm in MGY1, 207 East Main. Preregistration is preferred but day of registration is welcomed. Yoga builds strength and flexibility through physical postures while helping students understand individual stressors through techniques that include mindfulness, breath, and gaze. Through a regular yoga practice, awareness and quality of one’s physical, mental, emotional, and spiritual health are improved. Students will learn basic yoga postures, proper alignment and breath work, and be introduced to basic meditation techniques. This class is suitable for students of various ages although it is geared towards adults; no children under the age of sixteen please. The class is also suitable for people of various fitness levels. Poses will be modified to meet individual needs. Students should wear comfortable, moveable clothes and will remove their shoes during the class. A yoga mat is recommended but not required. Gentle, Restorative, and Beginner classes are included (and encouraged) in the February Foundation Course. while sharing quality time with friends and family. MGYS invites you to practice personal care from your mat as we welcome in the New Year, 2019. Please see the New Year’s Eve class and New Year’s Day event that our MGYS teachers have planned. 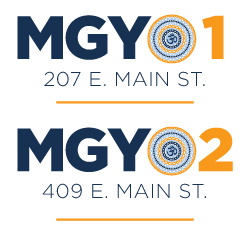 We hope you’ll join us in bidding farewell to 2018 and welcoming 2019 from your mat in downtown Nacogdoches at our original location, MGY1, 207 East Main Street. This is an All Level Hatha Yoga class. We offer a space to practice and take time to reflect on 2018, breathe in the present moment, and look forward to new opportunities of 2019. The more the merrier at MGYS so come share the last day of 2018 with this amazing yoga community that you’re partially responsible for creating. Good work! Join MGYS on New Years Day at 10:00 am for the 6th Annual Yoga Mala, 108 Sun Salutations, a ceremony to mark a community-wide transition that has become a tradition here at MGYS. The new calendar year is a great reason to investigate one’s life (thoughts, habit patterns, behaviors, and relationships). The purpose of this ceremony is to create a space for this exploration as well as to offer a structural model for productive investigation. Let’s begin 2019 together! Following the Mala, we’ll have light refreshments, traditional dishes, and a toast to the New Year. Please join in on the celebration. Classes will meet Tuesdays and Thursdays, 11.27 – 12.20.2018, 7:00-8:15 pm in MGY1, 207 East Main.